This book demonstrates the need for a new food policy to address the challenges for the global food system posed by globalisation, urbanisation, technical change and industrialisation. A collection of papers demonstrating the need for a new food policy. Looks at the challenges for the global food system posed by globalisation, urbanisation, technical change, and industrialisation. Suggests that food policy now needs to encompass issues such as obesity, food safety, and competition policy in the retail sector. Warns that meeting these challenges needs to be on the agenda of policy makers throughout the world. Written by experts from Denmark, Italy, the UK and the US. Features a table summarising old and new food policy. Draws on new research data. Simon Maxwell is Director of the Overseas Development Institute. Previously, he has worked for the UN Development Programme in Kenya and India, for the British aid programme in Bolivia, and for the Institute of Development Studies at the University of Sussex. Rachel Slater is Research Fellow at the Overseas Development Institute, London. Her doctoral and post-doctoral work focused on urban and rural livelihoods in South Africa. She has also worked in India, Lesotho, Mozambique and Zambia. 1. 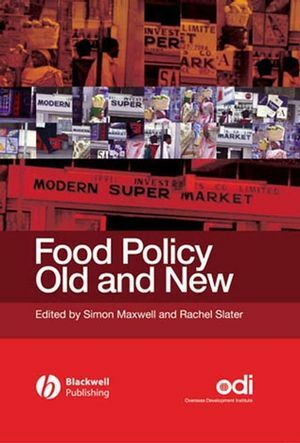 Food Policy Old and New: Simon Maxwell and Rachel Slater. 2. Food Industrialisation and Food Power: Implications for Food Governance: Tim Lang. 3. Food and Poverty: Insights from the ‘North’: Elizabeth Dowler. 4. The Nutrition Transition in the Developing World: Barry M. Popkin. 5. Redirecting the Diet Transition: What Can Food Policy Do? : Lawrence Haddad. 6. Value-chain Governance, Public Regulation and Entry Barriers in the Global Fresh Fruit and Vegetable Chain into the EU: Peter Gibbon. 7. Changing Food Systems in India: Resource-sharing and Marketing Arrangements for Vegetable Production in Andhra Pradesh: Priya Deshingkar, Usha Kulkarni, Laxman Rao and Sreenivas Rao. 8. Small Producer Participation in Global Food Systems: Policy Opportunities and Constraints: Sheila Page and Rachel Slater. 9. Food and Agricultural Biotechnology Policy: How Much Autonomy Can Developing Countries Exercise? : Erik Millstone and Patrick van Zwanenberg. 10. Food Trade and Food Policy in Sub-Saharan Africa: Old Myths and New Challenges: Christopher Stevens. 11. The World Food Economy in the Twenty-first Century: Challenges for International Co-operation: Hartwig de Haen, Kostas Stamoulis, Prakash Shetty and Prabhu Pingali. 12. Responding to Change: WFP and the Global Food Aid System: Edward J. Clay.